A brief post to document a new online tool called ‘Lino It’ which I made use of earlier in the week to complete an “assessment for learning” based lesson with my Year 10 Creative Media Diploma students. 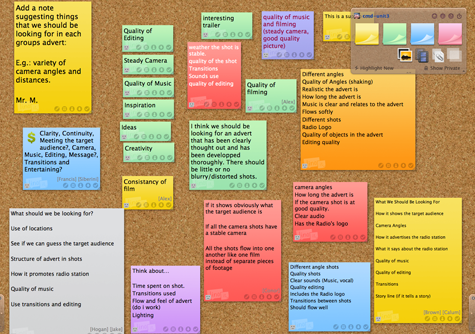 ‘Lino It’ is a powerful tool for online collaboration, brainstorming and sharing of information through sticky notes which can include text, hyperlinks, images and video. To some of you this will be sounding very familiar, and you would be right in thinking that it sounds like I am describing Wallwisher; a similar and somewhat better known “sticky notes” tool. However, I feel that ‘Lino It’ is much richer, in part due to the way that it handles video and images, but more to do with what it offers behind the canvas. After signing up (for free) you are taken to your dashboard in which you can create, edit and organise your canvases. You can store favourite canvases, create groups between users and also schedule events (within stickies) that can be linked with your Google calendar. Most importantly ‘Lino It’ is exceptionally user intuitive. My Creative Media Diploma students’ figured out more about the tool than I had in less than 15 minutes. Letting the students sign up was a great decision as it gave them ownership of their canvas and they were the able to arrange and control the “stickies” that were being added. My most recent discovery (while working on this post) is that you can embed your canvases in to your blog, website or Moodle course. They look fabulous and would make an excellent addition to a blog recording a student’s development of a project or as part of an online portfolio. You can try ‘Lino It’ for free or sign up to get started straight away. I love Lino – for the very reasons you cite; in particular, I love the fact you can use the embedding as a simple and effective way for the students to reflect – in weeks, months (years?) to come on what they've been up to – by getting them to embed it a class MLE site, or similar. Embedding within Moodle is the next step for me. I'm going to use it for starters and reflection/revision. 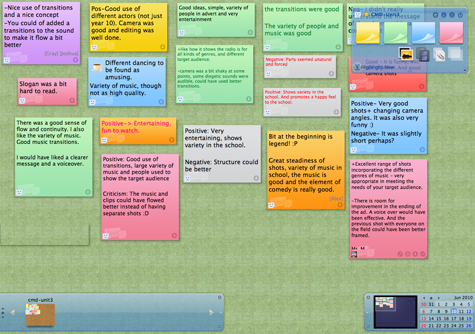 I also plan to use it during a classroom based lesson where I will display a canvas on the IWB. With the pen working I will ask students to simply walk up and add to it during the lesson, using the floating keyboard. The questions and points will provide the material for the plenary at the end of the lesson. Hello, I switched to Lino after using Padlet for a few years. I have tried to embed my Line canvas in one of my pages in my canvas course site, but it only appears an empty box…..I copy the embed code and then I use my HTML window to paste it….